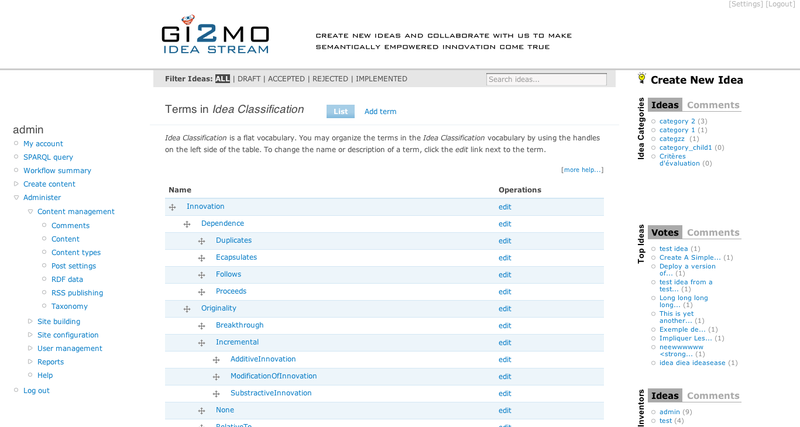 Some time ago we introduced a new view on classification of ideas. Now we would like to show how to use it together with our open-source Idea Management solution IdeaStream. In addition, this is going to be an example how IdeaStream can be easily extended using other Drupal modules to reach new functionalities that we did not quite foresee ourselves. Firstly, install taxonomy import/export module – it allows to create Drupal taxonomy terms automatically using information from xml, rdf, csv etc. In our case we are going to use a slightly modified Gi2MO Types RDF/XML (the owl classes need to be replaced with RDFS classes because of module limitations). Before importing terms create a new vocabulary (Administer/Content Management/Taxonomy/Add vocabulary) called ‘Idea Classification’ and assign it to ‘Idea’ content type . Afterwards import the terms to the created vocabulary using the provided RDF/XML file. 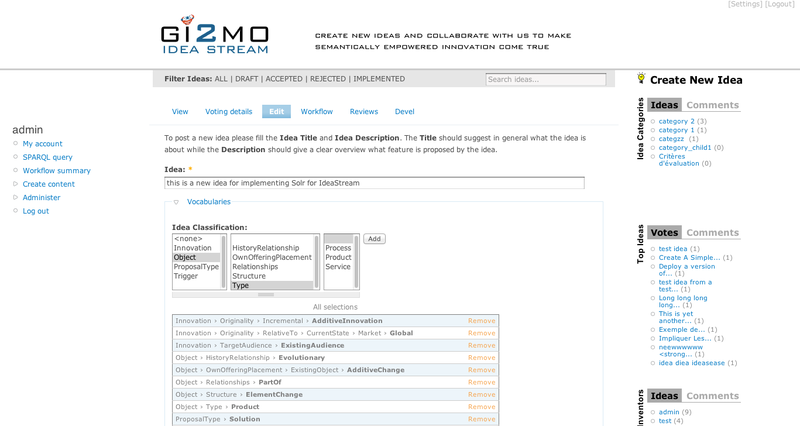 Gi2MO Types taxonomy imported into IdeaStream. After the taxonomy is imported it would be nice to have a convenient way of browsing rather a big tree of terms. For this goal we propose Hierarchical Select module. It allows to navigate the taxonomy in a visually appealing way and quite time effective at the same time. 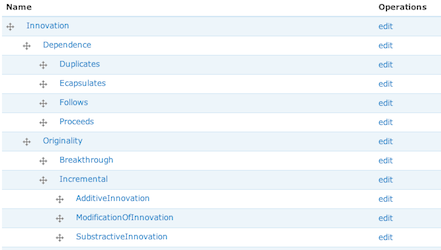 For the needs of IdeaStream activate modules: ‘Hierarchical Select’ and ‘Hierarchical Select Taxonomy’. Next in vocabulary settings (Administer/Content Management/Taxonomy) enable the hierarchical select widget for ‘Idea Classification’ vocabulary (enable ‘dropbox’ to allow annotation with multiple terms). 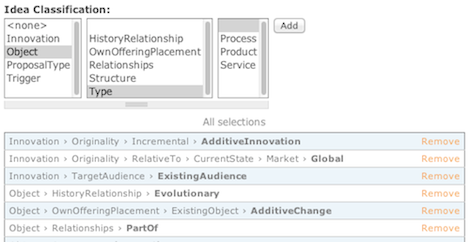 Gi2MO Types taxonomy in use for annotating an idea with Hierarchical Select module. Having installed the module you can try to create a new idea or edit an existing one and see how the updated IdeaStream theme nicely integrates with the new taxonomy selection features and displaying new idea characteristics! 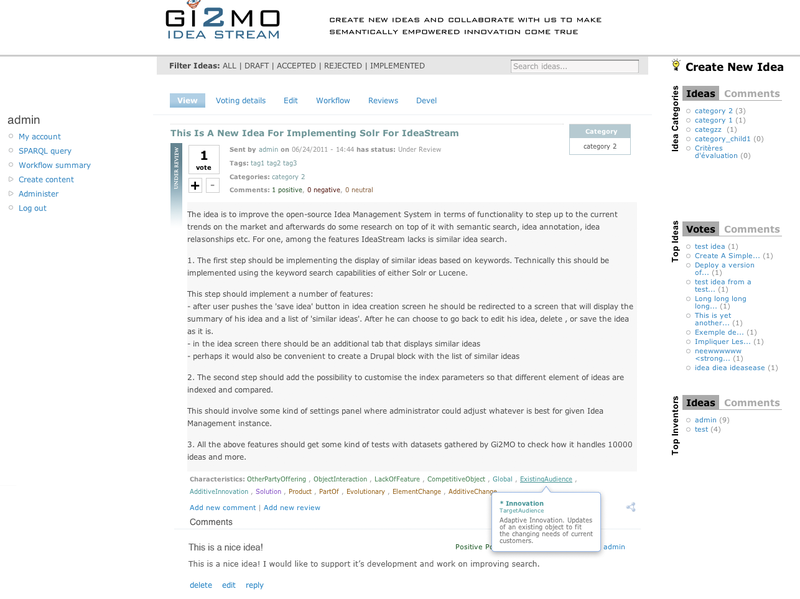 Idea annotated with terms from Gi2MO Types taxonomy (single idea view). The display of characteristics can be customised based on users role in the Drupal permission panel (so for example you can hide them for regular users and only make available for reviewers etc. ).